Analysts at Jefferies cut earnings per share estimates, but RBC's Mark Mahaney isn't so sure. After Amazon.com, Inc. (AMZN - Get Report) announced it would purchase Whole Foods Markets (WFM for $13.7 billion, many investors weren't sure what to expect. The fact that Amazon closed on the deal Monday shows management didn't want to wait months for approval and integration. Amazon quickly slashed prices -- more than 40% in some instances -- and started putting Amazon Echo products in the stores already. While many see the potential promise, others are concerned as well. Even TheStreet's founder Jim Cramer, who also manages the Action Alerts PLUS charitable trust portfolio, expressed concern. Cramer called Amazon his least-favorite FANG stock, explaining that even though new deals means more opportunity, it also means more pressure on gross margins. As that happens, it weakens Amazon's profitability. As of Tuesday's close, AMZN stock was down about 12% from its highs, suggesting this concern has merit. That's exactly the case that Jefferies analyst Brent Thill also made. While Amazon buying Whole Foods "presents a series of attractive call options," it also "puts a dent" into near-term profitability. 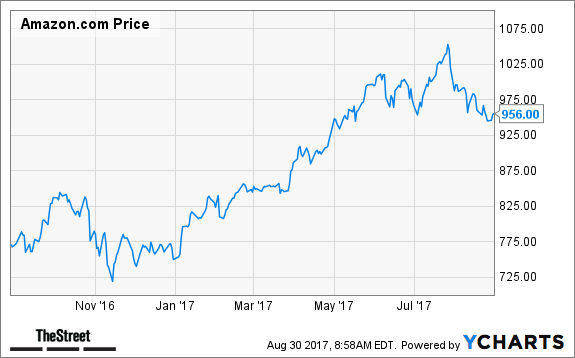 Specifically, Thill cut his earnings per share estimates 32.6% for 2017, lowering his expectations to $2.48 from $3.68. He made a similar move for 2018, lowering his EPS estimates 28.3% to $7.38 from $10.30. However, Thill did raise his revenue estimates, going from $171 billion to $177 billion in 2017 and from $213 billion to $228 billion in 2018. This makes sense, as obviously WFM sales would add directly to AMZN's top line. However, the bottom line reduction may be a turnoff for some. For Thill, he maintained his buy rating and $1,250 price target. Mark Mahaney, a well-known analyst out of RBC Capital, also weighed in on the deal. While Mahaney raised his revenue estimates by 8% -- slightly more than the 7% boost Thill gave Amazon -- he actually raised his 2018 EPS estimates "by 4% to $9.79." He did acknowledge that if price cuts continue, though, operating profit could decline slightly in 2019. Mahaney maintained his outperform rating and $1,100 price target on AMZN stock. Earlier this week on TheStreet, Jonas Elmerraji made the case that Amazon is on the verge of a "colossal breakdown" following the WFM deal. It also has mostly negative implications for other grocers -- like Kroger (KR - Get Report) , Sprouts Farmers Market (SFM - Get Report) and Costco Wholesale (COST - Get Report) -- as well as suppliers like Hain Celestial (HAIN - Get Report) .